Senator Dianne Feinstein has suggested the government should pass in-game gun restrictions if the game industry doesn't self-regulate. Late last year, the tragic massacre at Sandy Hook Elementary in Newton, Connecticut shook the country to its core. It's an event that spurred new debates on the issues of guns and violence in the United States, and will likely continue to ignite passions for years to come. As often happens in the wake of such events, videogames have fallen back under the scowling gaze of those who believe them to be an instigator of violence in our society. 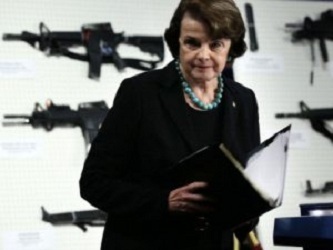 Speaking to a crowd of five hundred in San Fransisco on the subject of gun control, California Senator Dianne Feinstein leveled criticism at the game industry, suggesting that the government should consider taking action to reduce the presence of guns in videogames. According to Feinsten videogames play "a very negative role for young people, and the industry ought to note that. If Sandy Hook doesn't do it, if the knowledge of these videogames this young man played doesn't, then maybe we have to proceed, but that is in the future." Feinstein is not the first government official following the events in Newton to push for new restrictions on videogames. In early February of 2013, State Representative Debralee Hovey introduced a bill to the state legislature that would have levied special taxes on violent videogames in the state of Connecticut. That same month, again in Connecticut, state senator Toni Harp pushed a motion to make it illegal for minors to play arcade games involving fake guns. It's important to remember, of course, that videogames, thanks to the Supreme Court's decision in the 2011 Brown vs. EMA case, now enjoy the same first amendment protections as books, music and film. Even if a measure were passed by the government in an attempt to restrict the content of games, there would be tremendous legal precedent to help opponents strike it down.